cardio | One road to health. I had somewhat a successful recovery from yesterdays training: chest, back and shoulders were a bit tender, but that’s the sweet and right kind of pain. I was pleased and pumped to hit the gym! Today I did a smoothie for breakfast/pre-workout drink. I had fat-free milk, some quick-oats (dried berries included), quark and Mass Nutrition My Whey protein powder mixed together. I got to tell you, this was a good mix. Gave enough energy to feel pumped and didn’t know nothing about hunger until after the workout was over! Crunches with extra weight 100 reps.
Had a really nice feeling about this workout and also about this new program. Using the compound workouts I can get more out of my workout and do feel, that this 2-divided 4-times a week training rhythm suits me as well as training in the morning AFTER breakfast. Even though my left hamstring is under ice at the moment, I feel I did quite nicely and I’m hoping that my recovery will be a bit better than last weeks. Going to go an take a walk in the evening and see if that helps! Anyways I decided to take the time today and train my biceps and triceps and also do some squatting aka. leg workout. Bicep-curls 3 sets, 12-10-8 reps with 15-17,5-20 kg. 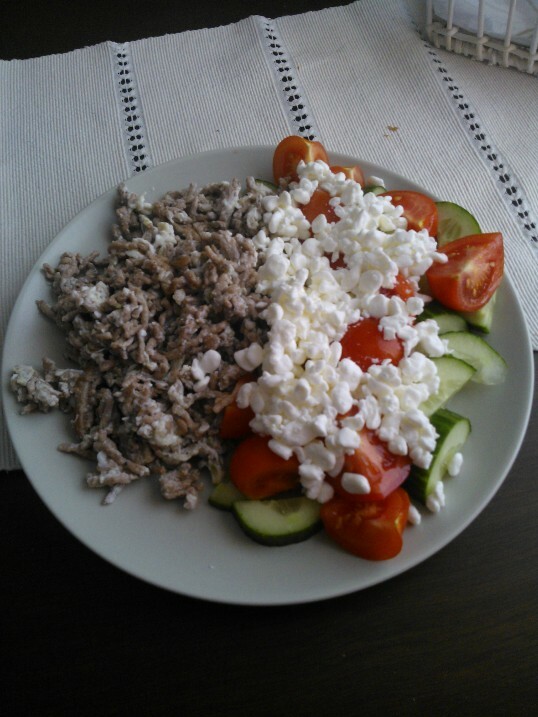 Post-workout meal: 300 g minced meat, cottage cheese, cucumber and tomatoes. The feeling was awesome. I was a bit worried that I had lost some of my power, but everything felt good, part from the muscle cramps afterwards, but anyways. I was trying to take it easy, but was pleased that everything went so smoothly! Now after 1 hour of walking with the dog I’m off to do my stretches and I’m going to hit the sauna afterwards! Hey guys! It’s been a while here, sorry for that! Grandma Autio had her 85th birthday and it was great, she was so excited to see all the relatives and family. Got this pain in my calve after last set, so I decided it was better not to train anymore. Nevertheless, my quads and hamstrings were on fire! I started watching the show ‘Spartacus’ on TV and noticed, that those guys are ripped! Surfing in BodyBuilding.com found this cool routine that looked like loads of fun and it actually is made by the Spartacus trainer, Tyrone Bell. Tried this out today and I’m going to feel the burn all day long! Dumbbell Bicep Pump Curl: to failure: 29 x 10 kg. Amazing burn afterwards, but nevertheless, had to hit the elliptical for 28min interval program. After that, had to change my shirt and hit the shower. Today I’m feeling a lot better than yesterday, I think that the flu is finally beaten and I can hit the gym next week! Today we went shopping for some clothes with Linda. It was nice to see, that I could buy jeans that were 4″ slimmer on the waist than the old ones that I had. Also found some other pants that are bye-bye officially. Feels great to finally see and feel the effects of 2 months training, needless to say I’m pleased. But there’s still a long way to go. I read somewhere that a fitness model or a role-type is a good thing to have, so I picked mine. Stephen Amell from the TV-show ‘Arrow’. I like to think that his physique is quite awesome and trying to accomplish that is something wort trying to do. I’ve been thinking of trying out a new workout routine, trying to find out during next week what would suit me the best and will keep you guys posted. Next week it’s all about cardio for me. Rowing, biking, running and my personal favorite: elliptical trainer are going to be more than familiar next week. 4 x 40-80 min is the target, we’ll see if I can hit it. Have a great weekend guys, I sure will! Grandma will turn 85 tomorrow, that’s amazing! Feb 22 Training: Leg workout with Cardio blast! Today I hit the gym little later than usual because I have the day off! It had snowed last night so I went to push the snow from my mothers yard and it gave me a good warm-up. I was really excited hitting the gym today, felt pumped! Cardio: Elliptical trainer (surprise, surprise) 28 min with a hard interval training, HR maxed at 190. Felt really weary after this training, legs were shaking and needed to sit down and catch my breath. I had four intervals during cardio, about 3,5 min each and I really worked the last one as hard as I could. Between the intervals there were these lighter sets with about 3,5 min each. Tomorrow it’s floorball Saturday folks! And that means 60 min of intense cardio and laughter. FYI, I hit a milestone this week. From the beginning of the year, I’ve lost 22 lbs. I’m pleased and right on schedule. To HIIT or not to? High Intensity Interval Training aka. HIIT has been on my mind today. I’ve read about this and all sorts of tips have been displayed all over the web. What is HIIT actually? This is how I understood it. You save time, you intensify your training and you am up your fat loss. Sounds good? Sounds even too good? Maybe, but anyways I gotta try this one out! In HIIT training you’re doing cardio, whether you’re on the treadmill, elliptical, running cycling you name it, you’re doing these hi-tempo intervals with resting periods in between. You’re going to give all that you have in you, heart rate being at 95% of max. The ratio between the high intensity and the lower intensity level is 1:2, so e.g. if you’re training 1 min with full tempo, you’ll have a 2 min lower intensity right after you’ve finished. And you repeat this cycle 6-8 times per training and it is equivalent to an hour lower intensity training. You’ll be done in 30 min with 5 min warm up. Awesome. What is the benefit? What I’ve read is that you burn more calories afterwards from the training, comparing HIIT to a normal interval training with heart rate being lower. But anyways, even though if it shouldn’t work – I think I’d still enjoy doing HIIT because it’s a good way to amp up your cardio workout and really push yourself to the limit. I’m sure after repeating the last cycle, you’re done and you might want to call a cab. Or an ambulance. I know there has been a lot of chatter whether HIIT training is good or bad for you but I can think worse things that could go awry. One just has to remember to take it easy (pushing the limit, yes but over it…cautionary) and always remember to contact your medical doctor if you have a condition that prevents you from exercising or you’re unsure whether you should. Anyways if you’re interested in HIIT training, check out this BodyBuilding.com article, I found it to be awesome. Also Google is your friend as well.